Architectural roof terrace design embodies every aspect of urban living in London, not merely in style, geometry and maintainability, but also in pertinence of ambience – timelessly transcending trends through distinct indoor-outdoor associations and ad rem structural relatability within a built-up environment. 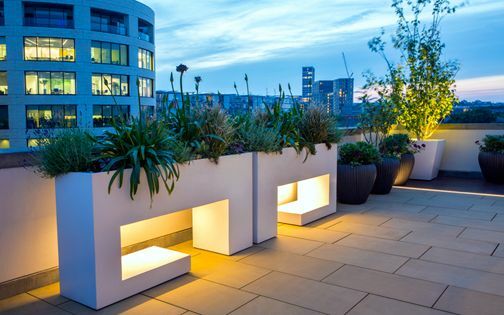 Invariably design-driven and inseparably custom-made, bold figurations, minimalist lines and immersive lighting, punctuated impactfully by sculptural plants and planters, embed congruence, scale, rhythm, balance and alignment to synthesise striking silhouettes around the clock and through the year. 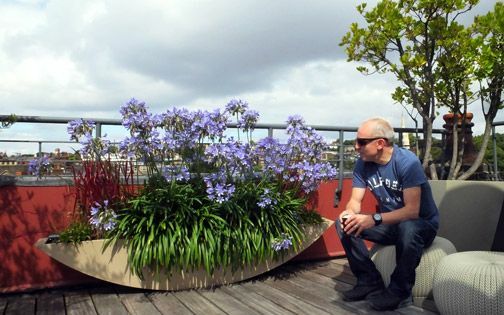 From innovational blueprints to long-lasting footprints, architectural rooftop gardens promote liveable symmetry with inspiring asymmetry, imparting focus and diverse ecologies in a prolifically developed city. 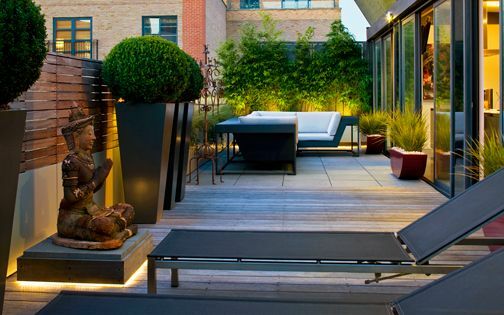 Architectural modern private roof garden in Central London. Unendingly understated, ergo memorably magnificent, well-integrated modern architectural rooftop designs impart their visual munificence in myriad locations – from the likeliest to the most unexpected. 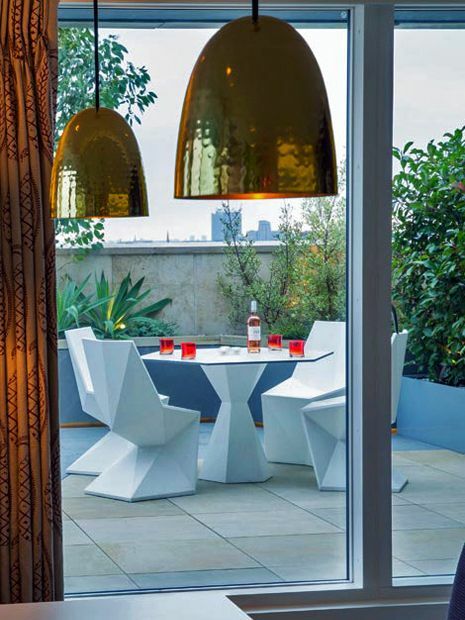 Here, at the heart of Covent Garden, above a period house originally built by a Stuart freeholder, a contemporised penthouse duplex apartment revels in a 360-degree panorama surveying every iconic landmark of the London skyline past and present. Energising the eclectic setting, while fashioning a sense of intimacy within a large-scale footprint, a multilayered rooftop planting scheme creates tactile verdant cocoons which are highly serviceable and fittingly architectural, alongside the favourability of an outdoor kitchen, autonomising alfresco activities, since the downstairs utility areas are positioned a long way away. 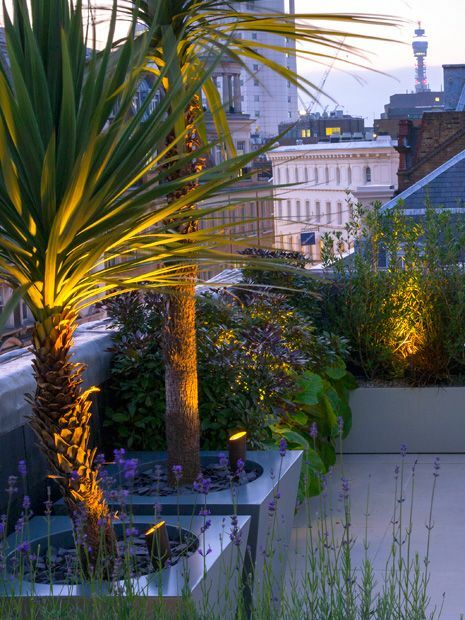 Architectural Mediterranean roof terrace garden in London EC4. 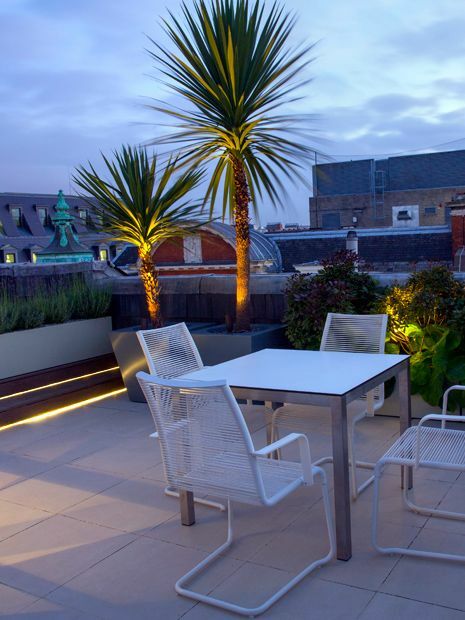 Which qualities define architectural roof terraces the most? 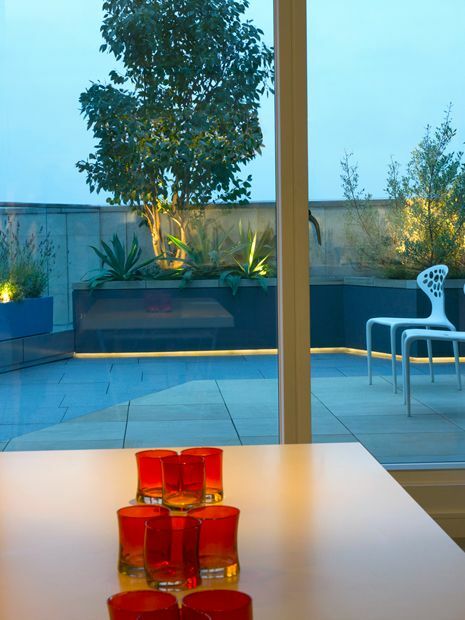 Boldness of focal points, interaction with landmarks, incisiveness of geometric planters, supersized surface dimensions, accentual lighting and eye-catching plants comprise unmistakable compositions with discernible energetic ambience. 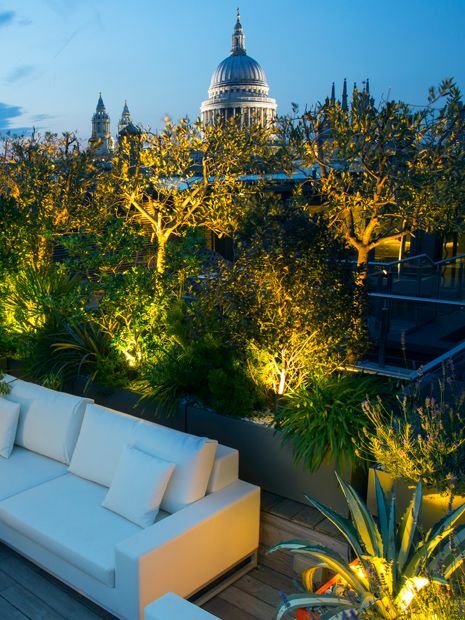 Architecturally spirited with awe-inspiring views, this small yet perfectly positioned city roof terrace contemplates the cultural duplexity of its axial sightline emanating from St Paul's and culminating at Tate Modern, enveloped by the emotiveness of myriad millennial monuments. 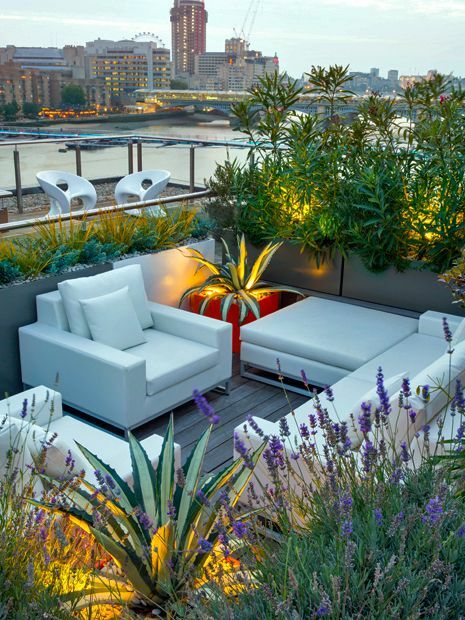 With formality of layout and naturalness of planting, this highly architectural rooftop design resolves both its provenance and south-facing aspect, where Mediterranean flora sprawls in a well-defined, cosy and contemporary urban setting. 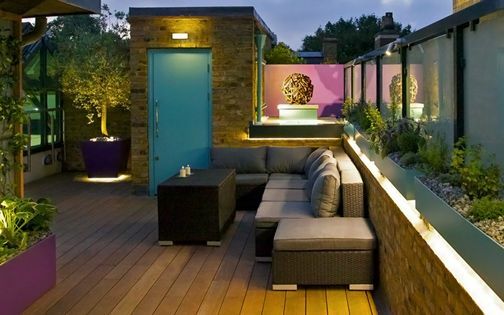 Architectural Art Deco roof terrace in London EC1. 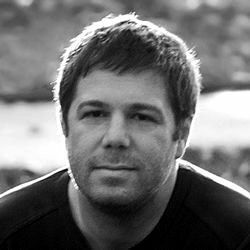 Where do we, as roof garden designers, stand architecturally amid the profusion of styles, approaches and viewpoints manifested in an ever-crowding London skyline? Continually boosting an architectural design currency through exploration of progressive roof terrace ideas, our blueprints showcase site-responsive, detail-oriented and client-focused concord; a city-bound vantage point immersively savoured outwards from this inner-city apartment and its small roof terrace. 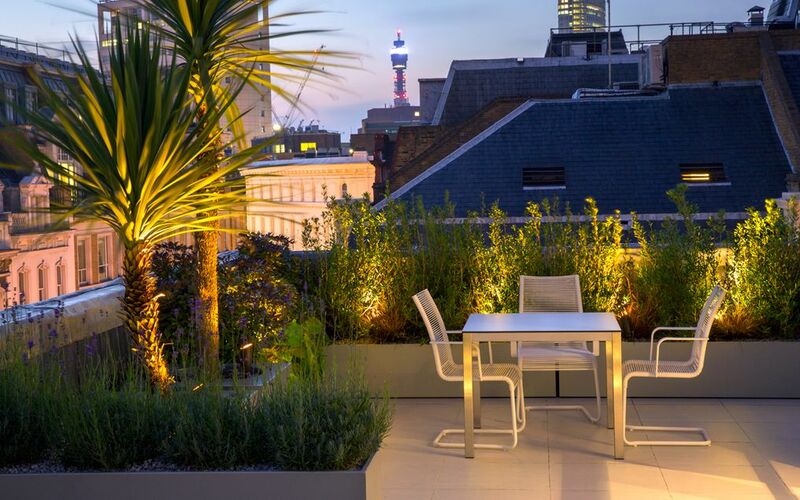 With a minimalist Art Deco residence perched atop the Ziggurat Building in Central London, the owner relishes an uncomplicated roof terrace layout, facilitated by a clear-cut architectural approach and its in-situ distinctiveness. 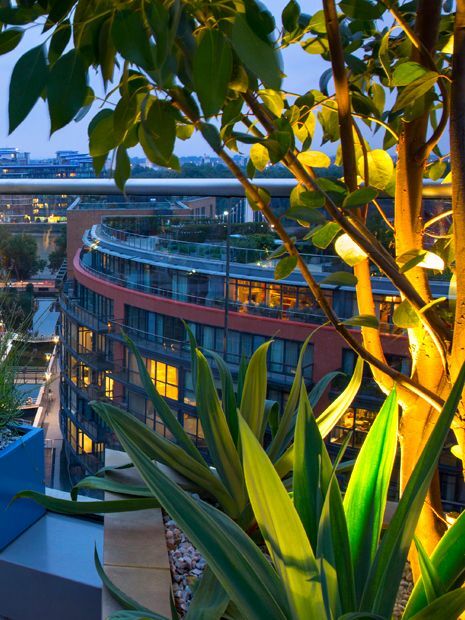 Crispness of skyline entails richness of detail, alongside effectiveness of amenities and outlinear distinguishability, and in this architectural rooftop, planter volumes, layered scale and contrasting foliage express definition of composition via sharpness of lines – a compactness of articulation with largeness of lineaments. 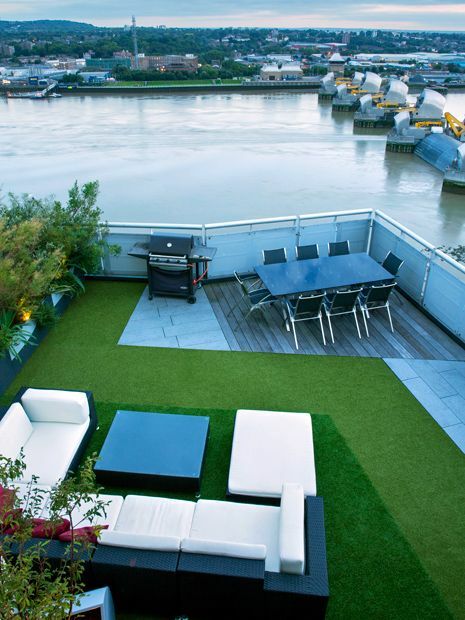 Architectural multilevel large roof terrace in East London. 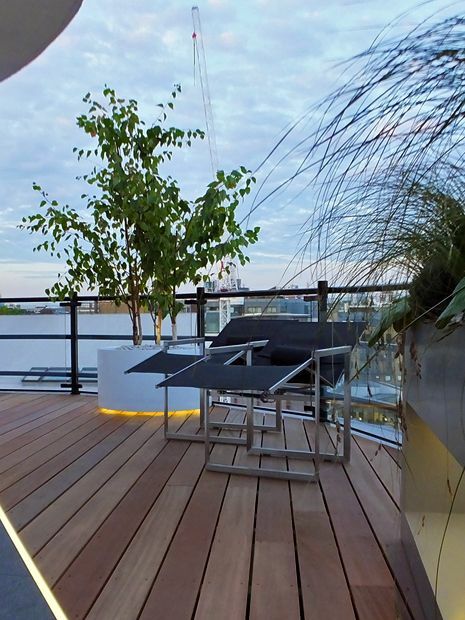 How do we develop pleasurable yet connective roof terrace gardens amid the tedium of London's cookie-cutter high-rise living? 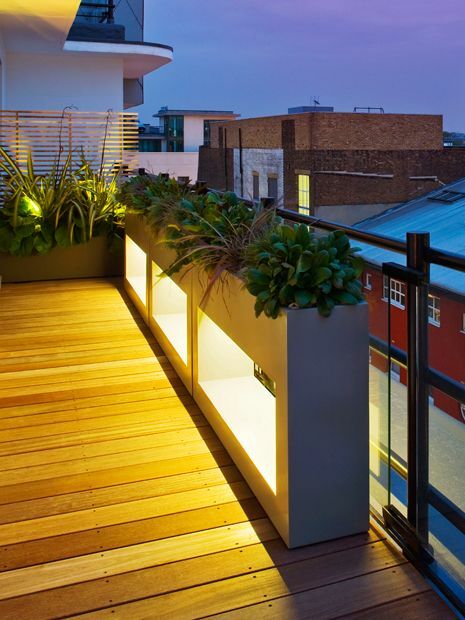 Planting vessels, sculptured planting, seating solutions, lighting techniques, refined detailing and landmark focality, bound by low maintenance rationality, and communicated through a reciprocal design process, originate effective and inspiring roof terrace hard landscaping – the decisive hallmark of modern architectural rooftop designs. 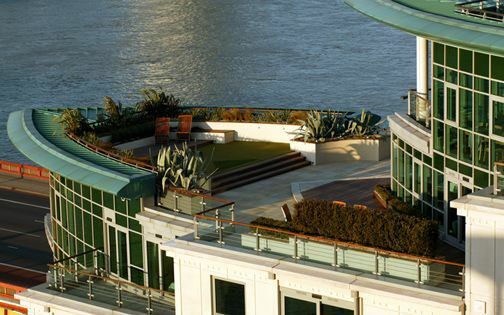 With a 1000-square-foot combined compass, our clients' roof terraces flaunt a lofty survey of East London, nestled across the 16th and 17th floors of a Thames-side duplex penthouse apartment, encompassing views chock-full of aerial action across three elevations. Sculpturally sustained in an architectural quid pro quo, this monumentality finds its stimulating analogies in the materials, shapes, surfaces, colours, juxtapositions and textures which reiterate the presence of Thames Barrier, its public park and waterfront elements. 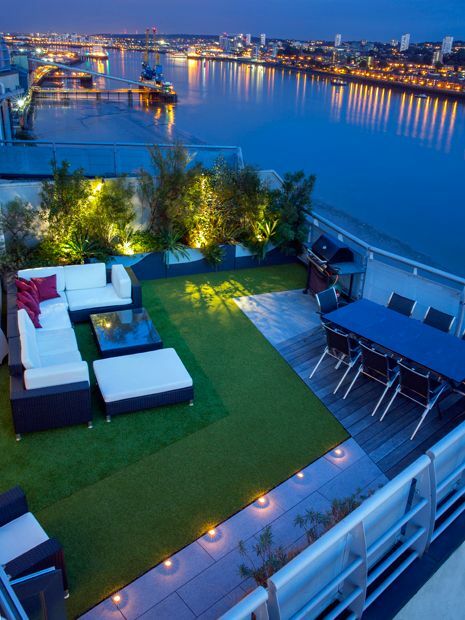 Architectural high-rise small roof terrace in South West London. 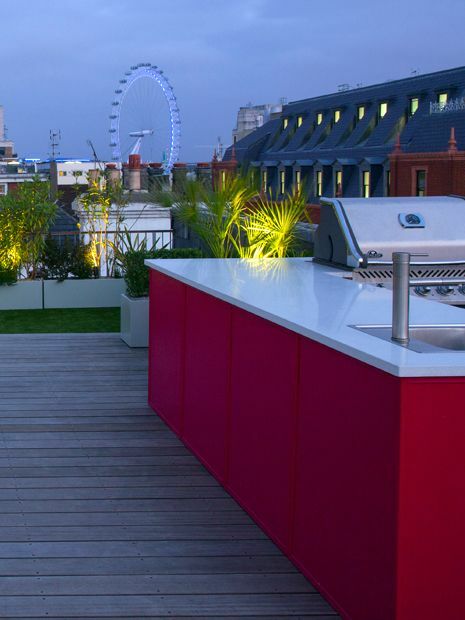 What elements are integrally appurtenant to all architectural roof gardens? 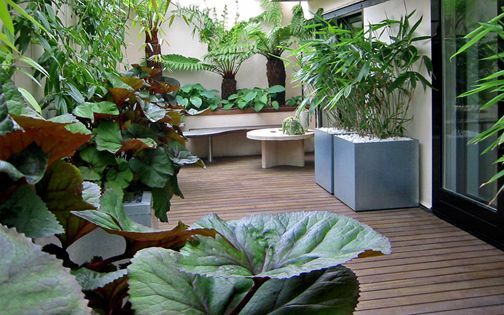 For us, plants provide the most resourceful, vitalising and inspirational ingredients of contemporary roof garden landscaping, deflecting immutable architectonics with contrastive energy, serenity and spatial empowerment. 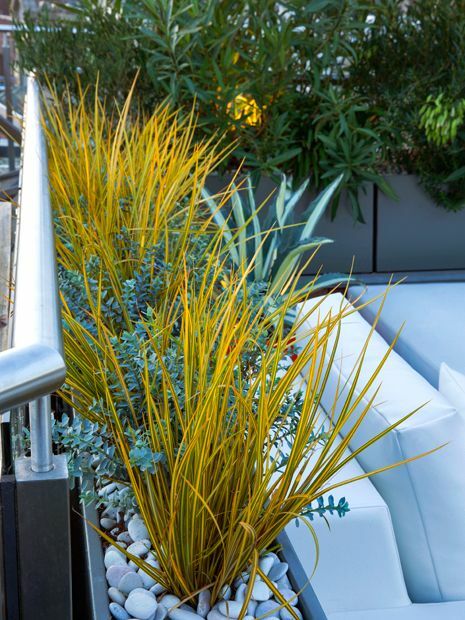 Superiorly wind-resistant, multi-stemmed plants epitomise architectural rooftop gardens, amplifying ambience during daytime, and even more so during night-time when lighting reveals tactual nuances of bark, form and foliar translucency. Design-led, well-equipped and favourably positioned, our client's 11th-floor apartment luxuriates in a quartet of small rooftop terraces, forming a sequential series of integral focal points. 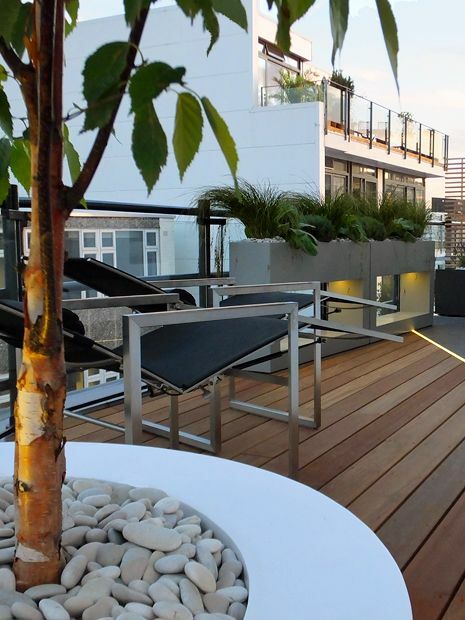 Heightening this homogeneous clarity, sculptural trees, floating raised beds and grid-like flooring surfaces communicate maximum momentum and optimal continuum in premium equilibrium – the indications of a harmonious roof terrace landscape design executed by meticulous construction, its boon companion, where plants, people and precious wildlife can coexist interdependently, expressively and diversely within London's modern architectural rooftop terrace garden settings. From the Gardens of Versailles to the modernist Californian Hills, classical design forsook its formality, horticultural histrionics and controlled compartmentalisation during a 3-century intercontinental deconstruction of general-purpose prescriptiveness. While lineation, composition and proportion remain largely unchanged spatial design principles, newfangled overtones precipitate architectural adaptations in contemporary garden design, stemming from cosmopolitan nuclei to suburban purlieus, and occasionally contrariwise – disseminating motivation and invention into architectural roof terrace designs. 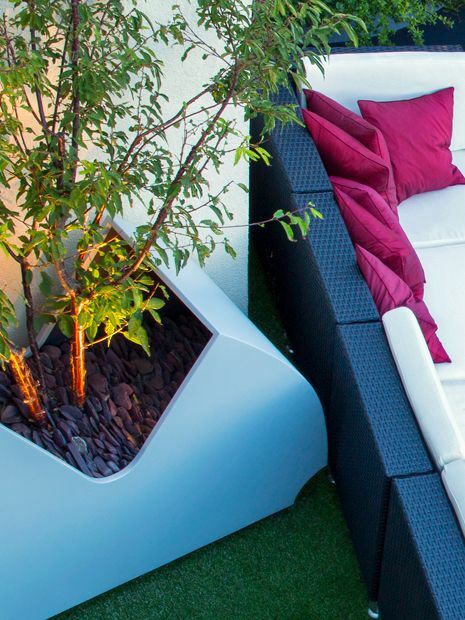 With a replenishable stockpile of minimal ornamentation, contoured compatibility and picture-perfect leafiness, abundant in technological prowess and modern building materials, the irresistible magnetism of architectural rooftop gardens repurposes, reorganises and recharges countless London homes through contemporary appositeness, where ergonomics, sociability and ecology elevate a mere celebration of outdoor space into that of people and our precious environment.